The modern cyclotron uses two hollow D-shaped electrodes held in a vacuum between poles of an electromagnet. A high frequency AC voltage is then applied to each electrode. In the space between the electrodes an ion source produces either positive or negative ions depending on the configuration. These ions are accelerated into one of the electrodes by an electrostatic attraction, and when the alternating current shifts from positive to negative, the ions accelerate into the other electrode. Because of the strong electromagnetic field, the ions travel in a circular path. Each time the ions move from one electrode to another they gain energy, their rotational radius increases, and they produce a spiral orbit. This acceleration continues until they escape from the electrode. The accelerated particles are extracted from the cyclotron when they reach the end of the spiral acceleration path. This beam of accelerated subatomic particles can be used to bombard a variety of target materials to produce radioactive isotopes. Various isotopes are used in medicine as tracers that are injected into the body and in radiation treatments for certain types of cancers. Cyclotrons are also used for research purposes in academic and industrial settings, and for positron emission tomography (PET). Positron emission tomography (PET) is a technique for measuring the concentrations of positron-emitting radioisotopes within the tissue of living subjects. The usefulness of PET is that, within limits, it has the ability to assess biochemical changes in the body. Any region of the body that is experiencing abnormal biochemical changes can be seen through PET. PET has had a huge impact on the clinical applications of neurological diseases, including cerebral vascular disease, epilepsy, and cerebral tumors. E. O. Lawrence and his graduate students at the University of California, Berkley tried many different configurations of the cyclotron before they met with success in 1929. 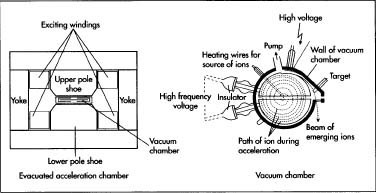 The earliest cyclotron was very small, using electrodes, a radio frequency oscillator producing 10 watts, a vacuum, hydrogen ions, and a 4 in (10 cm) electromagnet. The accelerating chamber of the first cyclotron measured 5 in (12.7 cm) in diameter and boosted hydrogen ions to energy of 5-45 MeV depending on the settings. One mega electron volt (MeV) is 1.602 × 1013 J. (J stands for Joule, the standard unit for energy.) The design, construction, and operation of increasingly larger cyclotrons involved a growing number of physicists, engineers, and chemists. Lawrence was never certain as to whether his research should be classified as nuclear physics or nuclear chemistry. The magnets in the cyclotron are made from 25 tons of low carbon steel with two nickel plated poles. Physically, the cyclotron weighs 55 tons, and is located inside an inner vault with concrete walls and doors about 6.6 ft (2 m) thick to shield the surroundings from the nuclear radiation present when the machine runs. Fortunately, most of this radiation has a half-life of only seconds to minutes, so there are no long-term waste disposal problems. Actual dimensions are approximately 100 × 100.5 × 39 ft (30.5 × 30.6 × 11.9 m). The coils are manufactured from annealed copper, insulated with fiber-glass and covered with an epoxy resin. The aluminum vacuum tank is sealed by polyurethane o-rings. The ion source uses a tungsten filament to energize the hydrogen gas and borated polyethylene packing is used to reduce the build up of thermal neutrons around components of the cyclotron. The target changer allows the cyclotron operator to select different targets on each of the beamlines to be irradiated and are made primarily from aluminum, with a minimum of stainless-steel to minimize neutron activation. The design of the cyclotron varies according to the specifications of the purchaser. Ebco Technologies Inc. builds two different types of negative ion cyclotrons, one capable of accelerating protons to a maximum energy level of 19 MeV (TR19) and the other capable of accelerating protons to 32 MeV (TR32). The standard configuration of the TR19 cyclotron is with two external beamlines but there is a scaled down version with an option of one beamline. The TR19 standard target configuration is with two external beamlines and eight targets. There is a design option of two to four targets on one beamline, with the upgrade to up to eight targets at a later date. The TR19 is also available in a self-shielded or unshielded configuration. The self-shielded feature eliminates the need for a cyclotron vault or major upgrades to existing facilities. Additionally, the magnet gap in the TR19 is vertical to minimize space. The radio frequency (RF) system consists of a RF amplifier, a coaxial transmission line from the RF amplifier to the cyclotron, a power supply, and instrumentation and read-back devices, an oscilloscope, current/voltage, power gauges, and interfaces with the computerized control system. A mass flow controller, needle valve, and pneumatic valve regulate the gas pressure and flow. A tungsten filament is placed inside the ion source and when heated will ionize the hydrogen gas. A plasma filter is placed on the ion source aperture to enhance conditions for negative ion production. The negative ions generated will be injected into the cyclotron at its X-axis. The injection system is manufactured from a set of steering magnets to focus the negative ions onto the plane of acceleration by the tilted spiral inflector. 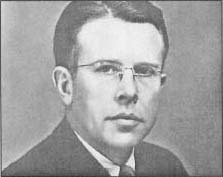 Ernest Orlando Lawrence was born in South Dakota on August 8, 1901. He received his bachelor's degree in physics in 1922 from the University of South Dakota. Lawrence entered the University of Minnesota graduate school, completing his master's degree in one year. He received his Ph.D. at Yale in 1925, remaining there for three years as a fellow of the National Research Council, then as assistant professor. In 1928 he became associate professor at the University of California at Berkeley. Two years later Lawrence became the youngest full professor at Berkeley. Lawrence conceived his most famous invention, the cyclotron, in 1929. He realized that to achieve particle energies of a few MeV (million electron volts) required for nuclear experiments, he could convert the particle's linear trajectory into a circular one by superimposing a magnetic field at right angles to the particle's path. Lawrence immediately proved that a particle's frequency of revolution depends only upon the strength of the magnetic field and the charge-mass ratio of the particle, not upon the radius of its orbit. This was the basic principle of the cyclotron, which Lawrence first re-ported in the fall of 1930. In 1932, Lawrence married and had six children. He was elected to the National Academy of Sciences in 1934, awarded the Nobel Prize in physics in 1939, and received the Medal of Merit in 1946 and the Fermi Award in 1957. Lawrence remained at Berkeley until his death August 27, 1958 from an intestinal ulcer. An example of an evacuated acceleration chamber with a close up of the vacuum chamber. prior to the shipping, rigging, and installation of the cyclotron and its sub-systems. The manufacturing process begins with the 25-ton steel magnet. It is machined from 10-in (25.4-cm) slabs and placed in-between the poles of a powerful electromagnet until the magnetic field area is precisely measured. Two nickel plated magnetic poles are forged from low-carbon steel. Two magnet coil assemblies are manufactured from annealed hollow copper and harden after being bent into shape. They are mounted in the yoke of the magnet, connected to water cooling headers, insulated with fiberglass, and coated in an epoxy resin. The aluminum vacuum tank is placed between the nickel plated poles and bolted into place. The vacuum tank has cryopumps that are bolted externally to cool the tank close to −459°F (−273°C) in order to freeze out any gases that may be present. The electrodes are machined from a single 0.06-in (1.6-mm) low resistively copper sheet (to optimize the energy transfer from the RF system to the accelerating hydrogen ions), cut out, and etched using boaring tools and drill bits. Next, the tank is sealed with polyurethane 0-rings after the copper electrodes are mounted inside. The electrodes are set, using nylon screws and spacers, into a round piece of industrial lisex nylon. A few holes are drilled in the nylon. Two are for the oscillator wiring. The third is meant for the vacuum pump; there is also a vacuum gauge attached to this port. On top of the nylon and surrounding the electrodes is a ring of poly vinyl chloride (PVC) pipe. This has several holes drilled into it, the largest of which is the detector storage tube. Also located in this material are smaller holes sufficient for supplying a voltage source to the deflector plate, for the set screws required to control its position, and attachment holes for the solid brass hook that will be used to hang the complete apparatus on a set of Helmholtz coils. Atop the PVC pipe is a piece of industrial strength clear plastic. This is both to allow people to see the inside workings of the mechanism, should anything go wrong, as well as increase the strength of the casing. On either side of the PVC is silicon gel, in order to maintain a sufficient seal around the main chamber. This is so that the vacuum will be as efficient as possible. The vacuum is needed because the alpha particles are heavily influenced by particles of any kind, especially air. That is why alpha particles are considered so safe; by the time they contact a person through any medium, their energy has been so severely affected, they are not able to do damage. The walls are guided in place by a thin I cut in the face of both the top and bottom sheet and both electrodes are held together with the use of 2 in (5.1 cm) nylon screws. No solder was used in these pieces so as to keep the inner chamber as clean and constant as possible. In one wall is cut a window, roughly 0.79 in (2 cm) long. Pivoted on a nylon screw is a slightly smaller copper plate (the deflector) separated electrically from the rest of the component. Outlying set screws can control the deflector position and both it and each electrode have an electrical connection. This is to allow the oscillator to be supplied to the electrodes and a large negative charge to be put on the deflector plate. The RF system is assembled inside a 19-in (48-cm) square, 6-ft(1.8-m) high metal chassis. Here, the resistors, transmitters, switches, tuning circuits, inductors, and capacitors are assembled by hand. Power supply cabinets are purchased and assembled for the water-cooled targets and magnets, ion sources, cryopump, and the water circuitry. The ion source will be injected after assembly of the cyclotron. A magnetic cylinder, 4 in (10 cm) in diameter and 4.7 in (12 cm) long comprises the ion source. Hydrogen gas will be injected through a capillary tube. The tilted spiral inflector is enclosed J b y a grounded helical shaped electrode. The electrode is machined on a fixed axis milling machine. Next, the target bodies are made of high purity silver, aluminum, and titanium and designed with helium-cooled thin foil windows. The two foil windows separate the target material from the high vacuum within the cyclotron. A recirculating closed loop cooling system is placed in the target services metal cabinet to cool the foil windows with high speed streams of helium gas. The tubing connections, solenoid valves, water-cooled beam stops, and electrically isolated collimators are assembled and attached to the target assembly. The target assembly has a solid aluminum plug that is pierced by a 4 in (10 cm) hole that will act as the target collimator. Grooves are machined onto the outside of the plug, and the o-ring is mounted to create the vacuum seal between the target body and the four position target changer. A collimating disc is placed between the plug and the target body with a window on both sides. Finally, the entire system is integrated with supervisory software to control and monitor the PLC hardware. Each step of the manufacturing process must be monitored to ensure that the parts are of standard quality. If any of the components have a crack or leak, radiation may get into the environment. The steel used in the magnets of the cyclotron is carefully monitored to ensure it has the desired properties. Magnetic fields are constantly checked by Nuclear Magnetic Resonance (NMR). The manufacturing process yields 2-3 tons of metal waste during production. This is recycled for future manufacturing processes. Due to the number of parts, the excess material from the manufacturing of the cyclotron is large. If any defective parts are found they are salvaged to the best of their ability, but the majority are scrapped. The improvements in sealing the cyclotron unit are requiring that less concrete shielding be provided at the installation site and provide a safer and more compact cyclotron unit. More powerful cyclotron units are being designed for commercial isotope production. The latest series of cyclotrons are state of the art, compact, strong focusing, four sector negative ion cyclotrons, with external ions sources, cryopumps, high precision power and control systems, and superb manufactured quality. They are now modular in design and share a common technology irrespective of the size and type of cyclotron. Lawrence, Ernest 0., and Irving Langmuir. Molecular Films: The Cyclotron & The New Biology. New Brunswick: Rutgers University Press, 1942. Burgerjon, J. J., and A. Strathdee, eds. Cyclotrons — 1972. New York: American Institute of Physics, 1972.